The Central Bank will issue a coin set for the Wu Xu Year of the Dog, the second set of the third series of the Chinese Zodiac Commemorative Coin Set, on January 25, 2018. 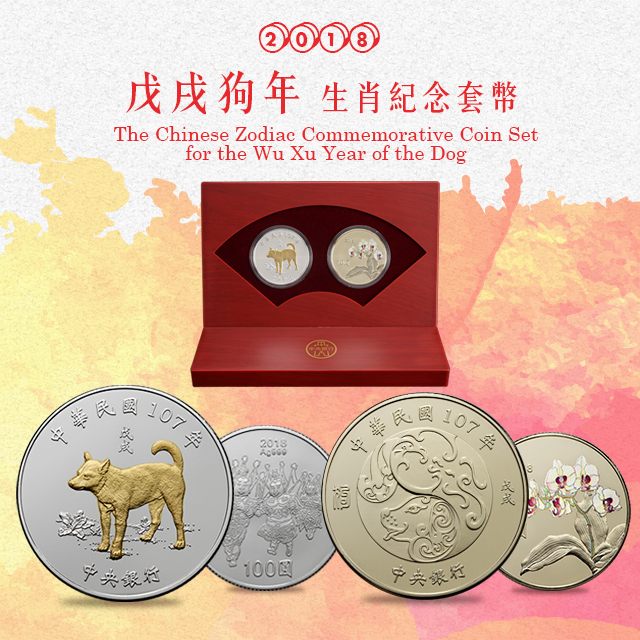 Each set consists of one silver coin weighing an ounce with a face value of NT$100, as well as one copper-alloy coin with a face value of NT$10. The Bank has delegated the Bank of Taiwan to sell the coin sets to the public on a first-come, first-served basis, limited to one set per purchaser at a time. A total of 120,000 coin sets will be issued. Each coin set costs NT$1,800.